Ten champions will be crowned Saturday at the NCAA Division I Wrestling Tournament, which is being held at Pittsburgh’s PPG Paints Arena. However, one title has already been decided. 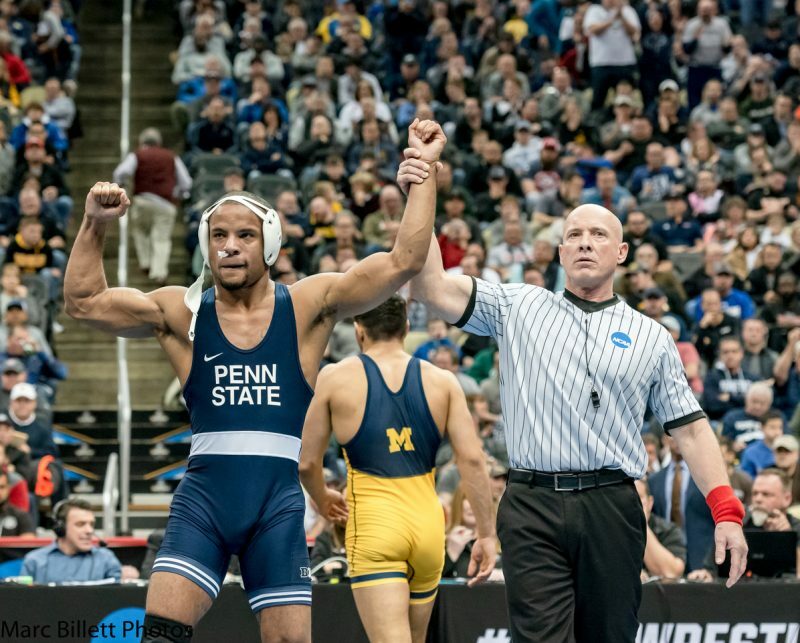 Penn State clinched the team title for the fourth consecutive year and eighth time in nine years with wins in five of six semifinal matches on Friday. Penn State enters the final day of competition with 120.5 points, while Ohio State is a distant second with 88.5 points. That’s a 32-point lead with only the medal matches to decide. The Nittany Lions will have five entries in the finals, including four who have won previous titles, and two in the consolation finals. The Buckeyes have three entries in the finals and only two in the consolation finals. Jason Nolf, Vincenzo Joseph, Mark Hall, Bo Nickal, and Anthony Cassar earned title berths for Penn State. Nolf (30-0), a Kittanning graduate, remained unbeaten with a hard-fought 3-2 victory over North Carolina State’s Hayden Hidlay in the 157-pound semifinals. Nolf, a two-time defending champion and top seed, earned his fourth consecutive trip to the finals. He will face Nebraska’s Tyler Berger (28-3) in the title match. Berger advanced with a 5-3 semifinal win over Iowa’s Kaleb Young. Joseph (27-1), a Pittsburgh Central Catholic grad and No. 2 seed, claimed his third consecutive title berth title berth with a narrow 3-2 win over Arizona State’s Josh Shields (30-4), a Franklin Regional grad, in the 165-pound semifinals. Joseph, a two-time defending champion, will face No. 8 seed Mekhi Lewis of Virginia Tech in the title match. Lewis (26-2) advanced with a 5-2 upset of No. 4 seed Evan Wick of Wisconsin. Hall (30-0) needed double overtime to record a 2-1 victory over Michigan’s Myles Amine (20-4) in the 174-pound semifinals. An escape by Hall in the tiebreaker period was the difference. Hall, a champ in 2017 and runner-up last season, will face Arizona State’s Zahid Valencia in the finals for the third straight year. Valencia (30-2) advanced with an 11-3 win over Missouri’s Daniel Lewis. “I think I’m just going to wrestle,” said Hall, when asked about his rematch with Valencia. Nickal (29-0) earned his fourth trip to the finals with a pin of Princeton’s Pat Brucki (32-2) in the 197-pound semifinals. It was Nickal’s third pin of the tournament. Nickal, a two-time champion, will face Ohio State’s Kollin Moore in the title match. Moore (23-2) advanced with a 12-4 over Oklahoma State’s Preston Weigel. Cassar (29-1) earned his first trip to the finals with a 4-3 win over Minnesota’s Gable Steveson (33-2) in the 285-pound semifinals. He will face Oklahoma State’s Derek White in the title match. White (32-1) advanced with a 3-1 overtime win over Lehigh’s Jordan Wood. “I always envisioned me with my hands up, kneeling on the ground, pointing up to God as a national champion,” said Cassar, when asked how he envisioned his first NCAA Tournament.